Warning. This post is loooong. Tim and Anne co-wrote it. Singly they tend toward verbosity. Together? Oy. Maybe grab a cup of coffee or beer before you start. Probably the best thing about this little bike blog thing is all the great people we’ve met. Folks like David and Stephan from Dutch Bike, Marge (who we’ve yet to physically meet, but I’m sure we will some day), Marcus and Elliot from Austin on Two Wheels, Val, and more. It’s been a great ride. One of our newest blog buddies, George loaned us his Madsen KG271 (you know, the long bike with the big bucket on the back) for a 10-day testing stint. Full disclosure: George is friends with the owner of the company and asked us if we’d give his own personal Madsen a try and share our impressions. He didn’t ask for any sugar coating, and it’s a good thing. Tim’s not real good at being sweet. Over the course of a week and a pair of weekends, we both had the opportunity to ride the Madsen as part of our daily routines (where we normally ride our Xtracycles and Anne’s Oma), as well as on a couple special-purpose, made-for-Madsen adventures. Tim picked up bags of compost; Anne transported three kids home from school. We even had some of our bikey neighbors take it for a spin. Overall, the idea was to see how this one bike (in one size, shared by two people of very different size) could fit into this bike life we’ve built for ourselves. Just a few years ago, when we started exploring cargo bikes, we had no idea that so many options existed. 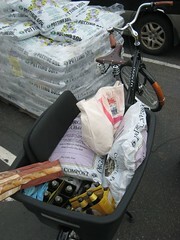 As with anything else new, once we opened our eyes to transporting stuff via bike, we saw options everywhere. From oyster buckets bolted to a rear rack, to the Xtracycle Free Radical, to the beauty and utility of a dutch bakfiets, utility cycling is rich in choices. The great thing about cargo bikes—really, with any bike—is this wide variety means there’s something for everyone. Different bikes appeal to different people for different reasons. The Madsen is no different. The Madsen definitely has a place in the market. My kids, at 6 and 8, are too old and large to sit in the bucket. But if you had small kids, this would be a dream cargo bike. I think it would appeal to families with small kids (preschool age) that need to be ferried to school, activities etc. Because the bucket has seating for four small children, you really could use it as a carpool bike for small kids. It also works well as an urban grocery getter. That bike can haul a lot of stuff! That said, the Madsen wouldn’t be my first choice for a a daily driver. I use my cargo bikes (Xtracycle and Oma) as a primary mode of transport—I ride them everywhere. Cargo bikes give me the ability to go about daily business on my bike while providing the flexibility to stop at the store when I’m out and about and pickup (a lot of) groceries or a kid or just about anything as needed. Yet I’m still riding a pretty normal bike that’s easy to maneuver and lock up anywhere. Even though my Xtracycle is super long, it’s still pretty nimble and manageable. The Oma is more “normal” (not to mention stylish) and can still haul quite a bit in the front rack/basket and on the rear rack/panniers. It also hauls a kid quite easily on the rear rack. When I was riding the Madsen, I didn’t feel that same ease. The bucket gave it that extra bulkiness that forced me to think about where I was going to park etc. I found I grabbed the Madsen when I knew I was doing an out and back errand. I chose one of my other bikes if I was planning to be out for awhile and making multiple stops. Finding a place to lock wasn’t super hard, but I definitely had to think before I parked. I also had a little trouble with the kickstand/center stand when I was attempting to park and lock the bike. It’s spring loaded and a bit touchy, surprisingly popping back up with with little effort. I’m sure I’d grow used to it, but the ease of release wasn’t confidence inspiring. The kickstand makes maneuvering into a bike rack a little tricky. You need to leave enough space to engage the stand without leaving so much that he whole unit ends up parked in the wrong place. We also noticed a tendency for the kickstand to twist; after a few uses the legs were skewed resulting in unstable parking. The legs could be pulled back perpendicular with the frame with a little effort, but if you didn’t notice the shift you might end up dumping the bike. This may be a nitpick and easily adjusted but figured it was important to mention. The giant bucket is inspiring, but I must say I’m addicted to the Xtracycle FreeLoaders. They really are the “universal carrying solution” The inside Velcro pouch does a fabulous job of storing small items (pump, patch kit, first aid kit, extra hats and gloves and various kid toys). It keeps the stuff out of sight so I feel comfortable just leaving it on the bike at all times. The outside pouch does a super job of containing larger items – bags, groceries, library books etc. The Madsen has a big open bucket on the back with removable Velcro benches for passengers. When I was riding the Madsen, I had to remember to bring all of those necessities with me and then carry them around while I shopped. (I guess I could just trust that my stuff wouldn’t get stolen and leave it in the bucket, but somehow seeing it in plain view in the bottom of the bucket made me feel like I should take it along). Maybe a built-in (locking?) box or trunk could be designed into the bucket mold? Again, I think the Madsen bucket bike would appeal to a segment of the cargo bike market. It seems like it would be great for families with small kids that want to use it as a car replacement for short errands and kid hauling. It’s good for out and back trips with specific intentions. But it’s not a bike I would want to ride around on a regular basis. Four bags of Cedar Grove Compost? Check. Two six packs of IPA. Check. Big bag of library books? Baguette, cheese, and some other miscellaneous snacks. No problem. This bucket holds a metric crapload of crap, that’s for sure. In fact, there’s room for more, but I can’t think of anything else I need. While loading this bad boy up, I actually wondered if that’s a syndrome that afflicts Madsen owners. While Anne and I play our game about who can carry more home from Trader Joe’s on our Xtracycles, we have to focus on density if we want any chance of claiming victory. The winner of our contest is measured in dollars. If we wanted to get crazy, we could do a weigh off. But still, bulk has no chance in our normal grocery runs. The Madsen seems to say, “bring on the bulk, and by the way, I don’t care if it weighs an assload, either.” By the end of my Saturday of errands (which involved riding uphill empty and downhill full) I was loving this thing. “What’s that? The neighborhood Boy Scouts are selling aged chicken manure by the half-yard? I think I can manage that.” Who cares if the geometry incites a bit of front wheel flop, the gearing is a little limited, or the chain guard rattles a bit? This is a $1300 bike that carries compost and chicken poop. Even in the baby blue color, you can’t get much more manly than that. But not-unlike our VW Vanagon camper, just because something is the perfect weekend errand-or recreational-transport, doesn’t mean you want to live with it the rest of the week. You know the rattly chain guard I mentioned. Totally a non issue in “work vehicle” mode; bugged the crap out of me by mile 6 of my commute. Same thing goes with the one-size sizing. The bike has enough adjustment that I could ride it on my-short distance errands comfortably. But that feeling didn’t last on my longish daily commute. The seat angle is pretty steep and combined with what felt like pretty short cranks (showing my inexperience as a reviewer I forgot to check. I’m guessing they are 170s? ), I found my my knee over pedal position way out of whack. Halfway through my trip home my knees were aching and I was wiggling all over the bike trying to get comfortable. In contrast, a couple weeks earlier I rode longer miles on a loaner, much too small Azor Secret Service. The slack geometry common to the Dutch city bikes absorbed my giant body, no problem. As a daily rider, the effort involved in squeezing the 160mm Promax Disc brakes would grow tiresome. With the low price of the highly regarded Avid BB7s these days, I wished Madsen had spec’d those from the beginning and had also gone with larger 203mm rotors. The stock brakes do the job, but for heavy loads it’s a lot more than two-finger effort. Shifting was crisp, but the I was puzzled by the choice of an 8spd freewheel. If they aren’t going to run multiple chainrings up front, why not go with a nice, low maintenance internal rear hub? This bike cries for some lower gears—at least in our hilly neighborhood. I don’t think I could have made the compost run in the uphill direction. I suppose a smaller front chainring might lower the gear range to manageable levels, but if they did that out of the box folks in flatter neighborhoods would probably complain about lack of top end when they were really honkin’. Still, I understand the gearing compromise. Without giving up that very useful chain guard for a triple crankset or employing the nuclear Rholloff hub option (they cost more than the entire Madsen), there’s really no easy solution. Lest you think I’m ripping on the bike, let me be very clear. This bike rules. It just doesn’t rule enough to win a place in my stable. Maybe if the kids were younger/smaller. Or if I was used to commuting on a “normal” bike every day. Or if my commute was around 5 miles round trip. Maybe then. As it stands now, I like riding my Xtracycle everyday. I can carry everything I want. Or not. I can go slow. Or fast. I don’t really see it as a compromise vehicle. For my bike life right now, the Madsen is too much compromise for daily use and I can’t justify another set of wheels for specialty weekend tasks. Do you own, or have you checked out the Madsen? Tell us what you think. 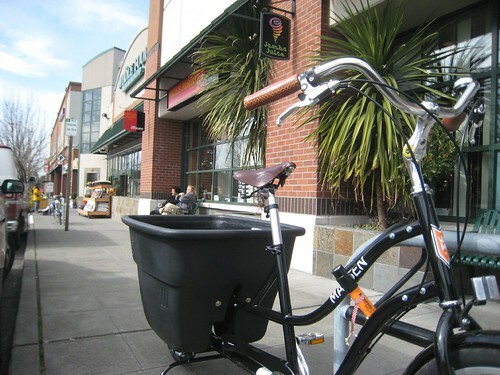 This entry was posted in alternative transportation, BIG Loads, bike lust, bikes, cargo bikes, kids and tagged bikes, cargo, cargobikes, kg271, Madsen Cycles, opinion, review. Bookmark the permalink. Nice review! Yes on the brakes, flop, kickstand, and rattle. I hear that Aaron Goss and the MADSEN crew are working on revised front geometry to improve the flop, and my druthers would also be IGH with chain tensioner, which would decrease maintenance and take care of the rattle. NuVinci would be ideal, but a Nexus 8 would do. Maybe they’ll offer it as an option, since they are starting to do custom spec for direct orders (as could your LBS, like Aaron’s). The geometry has been working for me and my 5’1″ wife, although if I city-biked the bars like George did I’d probably want to move the seat back with a Brompton seatpost adapter, which would Dutchify the geometry somewhat. Parking’s been OK for us, but I have a longish Abus chain which makes me worry less about how I park it. And yes, for a family with young kids and cousins like ours, it’s a *great* bike for the price. Like a bakfiets, it won’t be most folks’ daily long-haul commuter, though. That’s what makes the xtra’s seem so versatile. I can see wanting to go that route when our kids are older. PS – You guys should check out “Dreadnought 2.0” at Aaron’s Bike Repair. They started with a steel donor frame. Val did his Riding the Spine treatment (adding welds and bomber supports to the free radical), and Haulin’ Colin welded on a really nice frame-mounting system for a huge Wald front rack. Then it got a nice powdercoat and some Fat Franks. It rides great! I think they can do that frame/front rack/powdercoat for about $600, free radical not included. And it looks, well, a bit less “organic” than Dreadnought 1.0. Thanks for the info, Julian. I agree, that Bromptom adapter would help some. Basically Anne and I are sized where a next size up frame would help. We have 8″ height diff between us, but we start all the way up at 5’10”. But for most normal folks the sizing is a good compromise. And thanks for the info on the Dread 2.0. We’ll have to check it out. Val, if you are reading… any photos to share? nice review. I had forgotten about the madsen when I finally decided I wanted a Sorte. Then I thought I should have been more thrifty and done a madsen. I think the madsen is an awesome affordable option ( without test riding it) and when ppl inquire about my sorte and price I tell them about the madsen as something more reasonable. I’ll also send them to read this review for further info. I like my canopy to cover up our belongings although I live in a very “safe” burb. Still I only leave toys, kid books and helmets in it. Sometimes shopping stuff too. I do miss my own personal space like in a basket and need to rig up a little bag hanging from the handlebars to hold my glasses or sunglasses, phone ( for pictures) and coffee thermos. Where can a canopy for the Madsen be purchased? We did a review as well, but my experience was considerably more limited. My biggest gripes were the component specing (limited gearing, crappy straight mountain bike bars, totally wrong saddle choice for the upright position.) I really liked how this bike puts the center of gravity lower than my Xtracycle (which is with 700c wheels.) I agree the Xtracycle is a better all around bike, but this one seems better as a pure cargo bike combining the best features of the Xtracycle and Bakfiets. One other thought on the internal gearing option. I’m not sure the Nexus hub is robust enough for true cargo bike applications. My experience has been that the hub starts to fail under extreme load so I don’t fault them on going external. Great review. As a new Madsen owner, I agree with every point except the kickstand, with which I’ve had no issues. (I bought my Madsen factory direct and fully assembled, fwiw.) 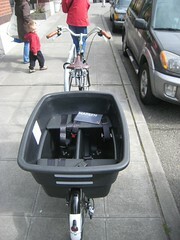 I use it to haul 2 or 3 small children, which is the task I find most difficult to do with my Xtracycle or trailer. Figured I’d sell the bike when the kids are a few years older, but time will tell. I am also in process of replacing the components you mentioned (saddle, bar, front brake, crank) to increase comfort and safety. I think a smaller chainring will reduce that chain guard rattle. (And yes, cranks are 170mm.) Cheers! Thanks Vanessa. I had forgot about the Sorte. Those are cool. I guess (and thanks, Carrie, too) small baskets/bags remain an opportunity to accessorize the big-box cargo bikes. Elliot – thanks for the link to your review. I meant to point to it. I think fat 26″ wheels help the Xtracycle center of gravity. 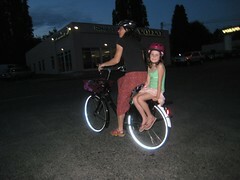 And if I recall, Todd from Clever has built up some big dummy’s with 24″ wheels. Supposedly that’s the stability/handling bomb. And that’s interesting about the Nexus hubs. They use them on the Dutch Bike Co Bakfiets and they seem to hold up just fine — I wonder if it’s the 20″ rear wheel combo or the weight over the rear wheel that causes the failure? The NuVinci Julian mentions is another good option. I’m pretty sure Val has been running one through many overloaded miles and last time I talked to him he was a huge fan. And thanks Matt — Like I said, it’s possible the stand was just loose. The slight awkwardness was probably just user error and a matter of getting used to it. Thanks all for your comments! Hi. I’m in Chicago and currently use a Burley to commute my 2 daughters (soon to be 5 & 7) to school. But they’ re busting out of it (size or weight) so I need a new commuter bike. (They can ride their own bikes for shorter trips, it’s not practical (distance and/or safety) for school commuting. I’ve been reading all your blogs for suggestions and have tested alot of bikes, including the Dutch/Bak bikes. And while the Dutch bikes are beautiful, they are out of my price range but I”m on the fence with the Madsen bucket bike. There are no Madsen dealers in Chicago and the closest one is in Madison WI but they only do special orders so I can’t test one. My question is, is there any other reasonably priced solution other than the Madsen that provides the same “safety” as the Madsen (e.g. the Xtracycle is not practical for my school commute in Chicago–unless there’s a way to strap them on, I’d be afraid they’d fall off when hitting a speed bump/pot hole)? THANKS for your help–any suggestions would be greatly appreciated. As you can probably tell, we’re partial to Xtracycles. Our kids started riding on the back when they were 3 and 5. We never had any issues with them falling off…and we go over lots of bumps etc. Some people (who are worried about kids holding on) do make seats and pvc cages http://www.flickr.com/photos/81325557@N00/3371470099/ and the like. Most of those projects are DIY – you can find lots of pictures on the web of different options. How big are your kids? At 5 and 7, I wonder if they are too big for a Madsen…? They seem to be better suited for toddler age kids. When I was testing the Madsen last year, I picked my kids up from school with it one day just to try it out (we went 5 blocks down hill). The kids were way too big and heavy to haul in the bucket. They could barely fit in there – I wouldn’t choose it for a daily kid hauler for school age kids. Hope that helps. Let me know if you have more questions.